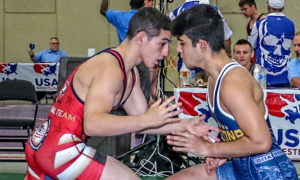 In our ever-expanding catalog of Senior Greco-Roman coaches reports arrives perhaps the most anticipated one, Fort Greco, which focuses on the Army’s World Class Athletes Program. Led by head coach Shon Lewis, Army/WCAP has long been recognized as a staple of consistent excellence within the United States, a fact that becomes apparent with just one glance at the team’s sparkling domestic record over the course of its existence. 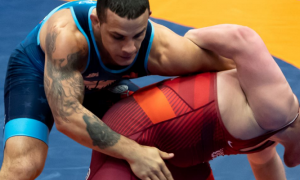 For this first edition of Fort Greco, Army/WCAP assistant coach — and two-time Olympian — Spenser Mango takes the reigns, discussing the slew of recent and upcoming activity affecting his charges. The conversation begins centered around 2008 Olympian/multi-time World Championships competitor Ildar Hafizov (60 kg), who won his second Dave Schultz Memorial title two weeks ago in Colorado Springs. Hafizov, a gifted technical marvel who celebrated his 31st birthday last week, is no stranger to elite international competition, and he’ll be back in action this coming weekend at the Grand Prix Zagreb Open in Croatia. 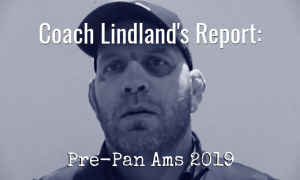 Coach Mango will be along for the ride, and discusses what he’ll be looking for out of his former teammate once wrestling gets underway on Saturday. 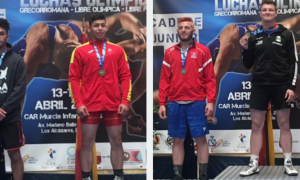 Two of WCAP’s three Dave Schultz silvers — National Team member Lucas Sheridan (97 kg) and ’16 National champ Toby Erickson (130 kg), are also brought up in regards to their respective performances. The report closes out with the premier topic everyone in and around Fort Carson is focused on these days, the 2019 Armed Forces Championships, set for later this month at Fort Bliss, Texas. Mango outlines how the team used the Schultz tournament as a baseline for the Armed Forces training phase, and also explains just how big of a priority that event is for the Army program as a whole. 5PM: First and foremost, talk about Ildar. 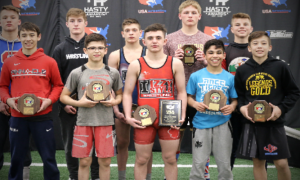 He had a great tournament at the Dave Schultz Memorial, and more importantly, he looked healthy. Is he as healthy as he looks? Coach Spenser Mango: Oh yeah, he had a great tournament. He’s healthy, he’s hungry, and ready to go. 5PM: What about Mike (Fuenffinger)? He had a sharp tournament, too, but it’s obviously not going to get the same attention as Ildar winning. What about his progress, especially coming off of last year? 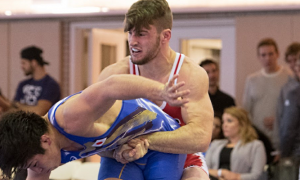 He had a solid tournament in Bulgaria, took second at the Open, the Trials didn’t pan out for him, but then he was back at Schultz and performed impressively. SM: I’m proud of the way Mike has been competing. He’s one of those guys, just super talented. With him, it’s more about minimizing the mistakes he makes in matches. I feel like the matches that he loses, it’s because he makes a mistake and it winds up costing him the match. He has to go out there, keep his mind focused, stick with his game plan, and just try to wrestle a mistake-free match. Get to his positions, those positions he feels comfortable in, and score from there without trying to do too much. 5PM: Lucas Sheridan at 97, he moved up last year and this seems like the place where he belongs. Is he now entering a stage where he should be in the running every time out, especially considering the way this season is playing out leading to the Open, Trials, and everything else? Is he building the kind of assuredness that indicates he should be one of the last two guys standing? SM: Oh, most definitely. I think changing weight classes is always a struggle and he’s building confidence within himself in that new weight class. But now? Yeah, he should be in the finals of every domestic event he enters. Luke is a very talented wrestler, we just have to work on the little things. Some of the stuff you can get away with in a lighter weight class you can’t do at a heavier one. But once he makes those adjustments, I think he’ll be right there in the running. 5PM: What do you say to Toby after coming off a tough match like the one he had in the finals against Georgia (Gocha Davitadze)? It was almost right there within his grasp in the second period. Coach Spenser Mango: You know, we came back and just talked about mat awareness. He had a chance right there at the end and it’s little things, like that moment at the edge. He had just scored, pushed the guy out. Come back, push the guy out again. We don’t need to go for a throw there, we can win the match. It’s pretty simple. But you’re tired, you’re working hard, it’s right at the end of the match and your brain isn’t working the same. So we were doing some mat awareness stuff with him, just knowing at what point in the match you can do certain moves, and what moves you probably shouldn’t. I was proud of the way he performed, he made the finals, it came right down to the wire against a tough Georgian, and he started the 2019 season off on the right foot. 5PM: You’re going to Croatia, you’ve got one athlete competing, and it’s a quick turnaround. Ildar is of course used to this kind of gig, he’s been on the Senior level for as long as you have. Ranking Series ramifications aside, what are you looking for out of him this weekend? SM: We want to go out there, we want to be aggressive, we want to get to our positions, and we want to make several attempts at scoring from our feet. When we get on top, we want to open up. We want to open up and put points up on the board. That’s the main thing with Ildar, we don’t want to sit back and wait for our opponent to dictate the pace of the match. We want to go out there and impose our will, and that’s something we’ve been working on. I feel like this year he’s scoring more points than he has in the previous years. He’s opening up and letting it fly. 5PM: Is that when you know he’s going good? When there are no pauses? SM: Right, yes, he’s the most dangerous Ildar when he’s attacking and going for throws and getting to his positions. That’s the Ildar we want to see this weekend and I’m excited for it. The first Ranking Series tournament, it’s a chance to get ranking points and some matches under our belt heading into the Armed Forces. 5PM: The Ranking Series is a hotter topic this year than it even was last year. Do you, as a former extremely successful competitor, like the idea of point values being assigned to placing relative to four events, and how those points may be associated with potential seeding at the Worlds? Do you look at this as a more significant event than usual? SM: That’s a hard one because last year I felt like in a lot of cases that the rankings didn’t work. We have a lot of guys who can’t make it to all of these ranking tournaments. There are a lot of these top guys who come in but don’t have that many points. But at the same time, it’s good to attach the Ranking Series to these tournaments to attract some of the top competition who can get there. You get to test your skills against the top competitors in the world before the Worlds. The ranking tournaments don’t hurt you, so if we go there and take top-three at any of the weights we earn some points, and those can’t hurt you for the Worlds. I don’t know. I guess I kind of like it. It’s an opportunity to make the regular season have some meaning to it, but at the same time, you never know who is going to be there, who’s going to come and who is not going to come. At the end of the day and you get to the Worlds, you have to win all of the matches whether you’re ranked or unranked. But I do feel like it’s a step in the right direction. 5PM: Schultz pretty much cracked open the season for Army WCAP with the Armed Forces Championships virtually right around the corner. How did it relate to the training phase for the Armed Forces? SM: Schultz was Schultz. We trained through it and got some good matches in that we could use to go back and look at some of the mistakes that we were making, along with the things we did well and want to keep on doing. But we didn’t train for the Schultz, we were definitely training past that. It was kind of a tournament to gauge where we were. A lot of things you think you’re doing really well in practice, once you get out into competition it winds up completely different. We had a lot of guys get some matches in and get that first one of the year out of the way. Now we get to go back with a lot of notes for the Armed Forces. We’re ready to go. We have our team set and we’re looking forward to a great Armed Forces with the rest of the service branches. 5PM: There is almost a mystique surrounding the Army and the Armed Forces Championships, especially with the winning streak. I think there are people who don’t fully understand what this event means and represents to the service branches. How does the Army program impress upon its athletes the importance of this event? Coach Spenser Mango: This is one, as Coach Lewis says, We’ve got to have this one. This is the one we have to have. No if’s, and’s, or but’s, even on our worst day, we have to have this one. When we go into this one, it’s do or die. We go out there, we’re expected to win, and we’re expected to dominate. And that’s how it’s going to be. There are no excuses. Follow Army/WCAP on Twitter, Facebook, and Instagram for updates on results and competitive schedules.